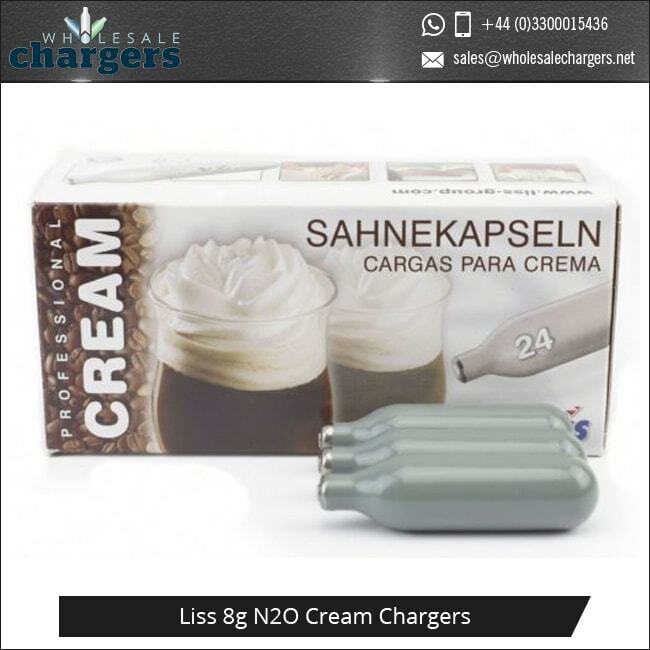 Liss Cream Chargers are available in packs of 12, 24 and 50. Each charger is individually weighed electronically with filling weight no-duds guarantee. Will turn 1/2 litre of whipping cream into up to 1.5litres of whipped cream! One cream charger whips up to 0.5 litre of liquid, whipped cream, desserts, mousses and sauces! Compatible with every industry standard cream whipper, Liss Cream Chargers will allow you to whip up fantastic results that are sure to down a treat at home or in a professional kitchen environment. Manufactured to the highest standard, using 100% recyclable steel, these refillable cream chargers contain approximately 10ml of food grade N20. N20 is frequently used within the food industry due to the fact that it is tasteless, non-flammable and colourless gas that does stops the growth of bacteria, meaning it is ideal for use throughout the catering industry. It is also a gas that is used in all corners of the globe as an effective food propellant, especially within the dairy industry. Of course, if you require any further information about any of our products, please do not hesitate to get in touch, our friendly and helpful team is always on hand to answer any of your questions. Founded in response to a growing demand for gas cylinders, soda siphons, and cream whippers, LISS quickly became one of the world’s leading cartridge manufacturers, producing products that not only optimise quality and performance, but have also been expertly developed to stand the test of time across a diverse range of applications. Armed with over 20 years’ experience working with predecessor companies, LISS manufactures gas cylinders, soda siphons, and cream whippers that can be used worldwide in virtually every branch of industry including commerce, science and research. Based in Hungry, LISS manufactures compressed gas cartridges and imports them to all corners of the world. They also supply various parts and equipment, which use gas cartridges including soda syphons and cream whippers, and are ISO9001, ISO14001, TüV and NSF certified. From hydrogen, acetylene, carbon monoxide and carbon dioxide through to shielding gases for welding applications, noble gases and high-purity specialty gases, LISS specialise in providing commercial and industrial gases that are used throughout the world. Liss products are only supplied to United Kingdom, Ireland, Spain and Portugal and cannot be re-exported or sold to any other country. 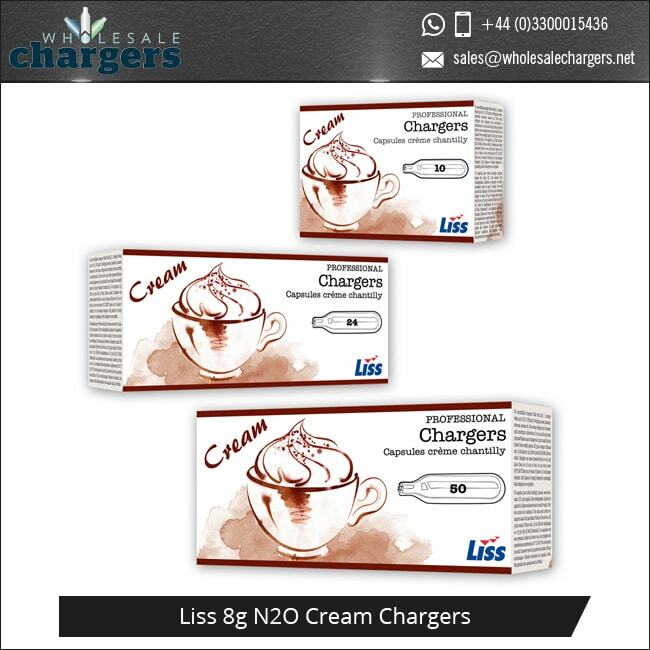 The Liss Cream Chargers you order will be delivered in Liss branded packaging. Working with some of the industry’s leading manufacturers, we have sold more than 50,000 cream whippers over the past 5 years. All of the cream whippers and cream chargers we supply have been manufactured to the highest possible standard in order to optimise performance, reliability, and functionality in a wide range of commercial kitchen environments. Offering outstanding performance when it comes to whipping up sauces, mousses, whipped cream, and more, all of our products not only enhance productivity in the kitchen, but they also offer great value for money. We sell two types of cream whippers, including Aluminium whippers with plastic heads that are designed for use at home, and professional stainless-steel whippers, which can be used in a whole host of professional catering environments. Aluminium whippers are not suitable for heavy commercial use and must not be put into dishwashers. How to spot a dangerous cream whipper! The vast majority of poorly manufactured cream whippers tend to be made from aluminium and feature square or squarish plastic heads. All of the cream whippers that we provide have round heads. The silicone seal inside the head is usually poor quality - discoloured and weak. The cream release trigger uses a cross head screw that can unscrew – you cannot unscrew our products. Before attempting to use any of our gas cartridges, ensure that you take the time to read through the manufacturer’s instructions that come complete with all of our products. When using your cream whipper, no more than 1 charger should be released in a 1/4L or 1/2 litre whipper, and no more than 2 chargers for a 1 litre whipper. 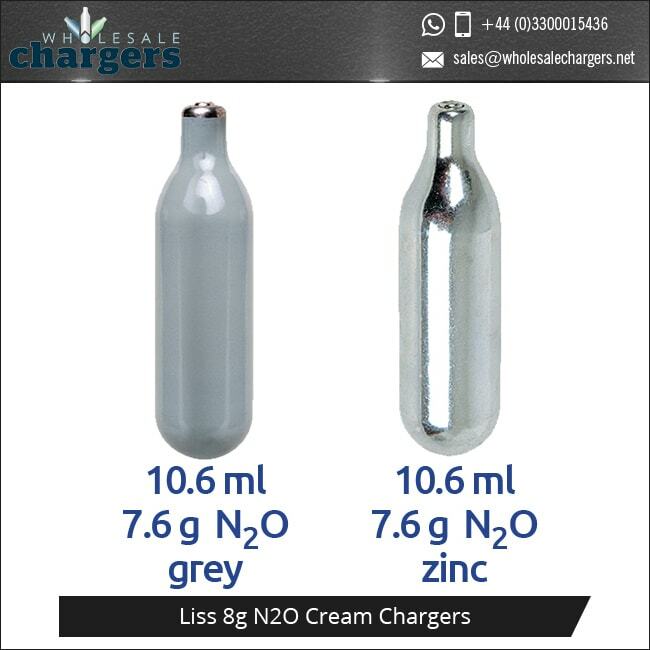 The chargers contain Nitrous Oxide or Carbon Dioxide under great pressure. Any attempt to pierce the sealing cap of these chargers without the correct equipment could result in EXPLOSION INJURY & SERIOUS FREEZE BURNS. EXPLOSION DANGER - do not incinerate or expose chargers to the sun or heat. Temperature not to exceed 50C. Pressurised gas cartridges must not be taken on board an aeroplane. No excuses, you may be prosecuted. Cartridge contains Nitrous Oxide (E942) under high pressure. Please only use with a device approved for this cartridge and follow manufacturer’s instructions. Never dispose of full cartridges. Explosion danger: 50C max temperature. Do not take on board an aircraft. If you are burnt by freezing N2O you must immediately seek medical advice. A N2O burn can cause deep tissue damage, which is not immediately obvious at the time of the injury. N2O gas cartridges contain 9 Cubic cms of pure N2O at approx. 60bar/900psi. We are proud to work with some of the industry’s leading manufacturers to provide a range of gas-based products that are suitable for use across a diverse range of sectors. There are only 4 worldwide manufacturers of N2O with automated and certificated production lines - we work with three of them to provide the very best whippers and siphons to businesses in all corners of the globe. Looking to find out more about the manufacturer that we work with? You’ve certainly landed in the right place! Specialising in providing cartridges for carbonating soda, inflating tyres, whipping cream, and inflating car airbags, Mosa is an internationally recognised brand that is considered to be one of the world’s largest manufacturers of high performance, disposable gas cartridges. Based on the western coast of Taiwan, Mosa Industrial Co-operation provides an extensive collection of consumer priced cream whippers, which have been manufactured to the highest possible standards. Within their performance-focused cartridge product range, you will find everything from cartridges for inflating tyres and whipping cream, through to those that are suitable for carbonating soda and inflating car airbags. Founded in 1992, Mosa is a reputable company that has continued to go from strength to strength, embracing the very latest technology for high pressure gas cylinders in order to improve the performance and functionality of their ever-evolving product range. Working with the industry’s very best engineers, Mosa have become leaders in their field, supplying chargers in a wealth of different sizes so they can be applied to a wide variety of different applications. These include everything from fire extinguishers, safety products, and medical equipment, right through to air bag system, car parts, and more. All safety standards are TUV and NSF certified. This leading brand has become one of the most reliable suppliers in Asia, offering a full product line that optimises customer satisfaction. Gastro are European specialists, providing N2O Nitrous Oxide Cream Chargers and Whipped Cream Dispensers. Gastro is the only European company selling N2O worldwide that are both Alibaba Gold Rated and Verified specialists in the field. 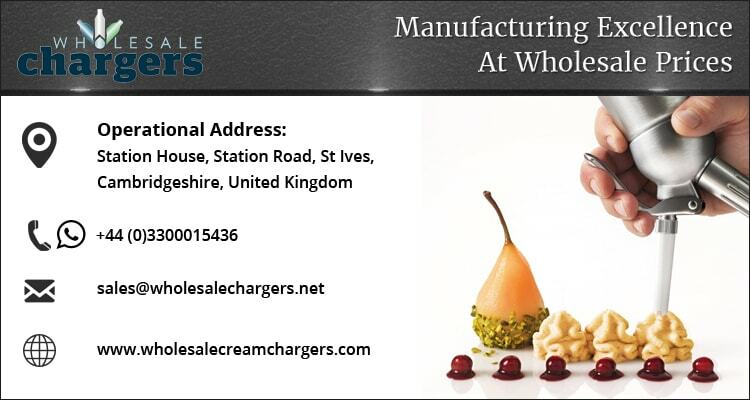 Directly from our 2 bespoke state-of-the-art factories, Gastro professionally manufacture and produce N20 Cream Chargers and Dispensers, all of which meet food grade standards passed for production. Our factories boast new and automated production lines, bring great quality control and efficiency. Founded in 1998, just one of Gastro’s factories boasts 50,000 m2 of workshop area and employs more than 800 employees. 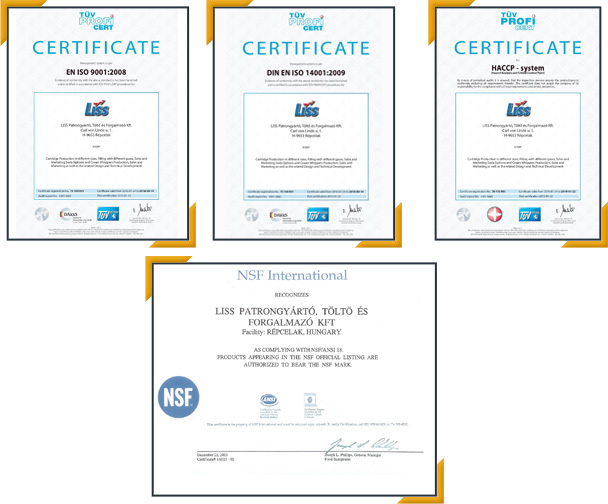 Gastro factory certification certificates and MSDS documents are available for inspection and inclusion with exports as required Including TüV, FDA, LFGB, DGCCRF, FDA food safety test and food grade standards certification. Our factories hold ISO9001 Quality Management System Certification, as well as ISO14001 certification. Individual, rigorous and regular pressure testing ensures our customers receive products they can use with confidence. Putting customer satisfaction first, Gastro also offers a bespoke customisation service that will allow you to enjoy the option of customising your very own design in order to promote your company on any product bottle. Gastro sells to B2B customers directly from their factory, including many multinational chains and wholesalers. Gastro exports to more than 30 countries and regions in America, Europe, South Africa, Thailand and Australia. Our biggest export markets are UK, Australia, Netherlands, USA, Sweden, Denmark and France. When 100% pure and natural CO2 was found coming out of the ground, the factory was opened to capture this unique natural source. Based in Hungry, LISS manufactures compressed gas cartridges and imports them to all corners of the world. They also supply various parts and equipment, which use gas cartridges including soda syphons and cream whippers, and are ISO9001, ISO14001, TUV and NSF certified. Based in Austria, iSi brings together power and innovation to optimise the performance and quality of their products. It is this approach that has earned them the title as leaders in their field, on a global scale, when it comes to the production of pressurised gas cylinders. Providing customised solutions for all applications in which compressed energy is required in the form of pressurised gas chargers, iSi has years of industry experience in providing energy needed for a wide range of new markets and applications, in the form of high quality disposable gas cylinders. Working with some of the industry’s leading manufacturer’s, we provide four different gases that can be used across a diverse range of applications. With this in mind, we are sure to have a gas-based product that meets the demands of your business. The versatility of these gases should not be underestimated. They can be used in a wide range of industries in order to complement and enhance everyday processes within your day-to-day business operations. We provide a great selection of high performance gas cylinders that are compact, economical, and powerful, making them the perfect solution for applications such as wine preservation, catering, electronics, propellants, and much more. Our fantastic choice of customised disposable gas cylinders ranges from 1 to 88ml in volume and can be combined with gases such as carbon dioxide (CO2), nitrous oxide (N2O), argon (Ar), or nitrogen (N2) yield. We put safety first across all areas of our business and carry out extensive 100% safety, leakage tests, and full traceability at every stage of the production process. Our in-house experts continuously check that standards remain high and that all manufacturing processes are completed to the highest possible standard. Trust us, nothing is left to chance and we always ensure that every manufacturer we work with has all of the necessary, industry standard certification. Highly versatile and used across a diverse range of applications, Carbon dioxide (CO2) can be easily compressed into a liquid in order to fill CO2 disposable gas cylinders that can be found in areas where energy for inflation, propulsion, evaporative cooling, or mechanical motion is required. As the CO2 in our cylinders is in its liquid state, you will also be able to benefit from a maximum gas yield in the form of expanded gas volume. Again, Nitrogen (N2) is a highly versatile gas that can be used across a wide range of applications, in a diverse variety of sectors. All of our disposable N2 gas cylinders not only offer reliable and fast inflation in environments with low temperatures, but they can also be tailored to accommodate the specific demands that come hand in hand with specialist applications. N20 is a therapeutic cooling medium that can also be filled into disposable gas cylinders in its liquid state, in order to support a whole host of applications and operations. Depending on the cylinder size you opt for, you will be able to enjoy an enormous gas and expanded gas volume. Our high performance, durable, and versatile disposable N2O gas cylinders are best suited for applications in the fields of medical cryotherapy and food technology due to their strong effects (evaporative cooling). However, they can be used across a range of other applications too. Argon (AR) can be used to enhance the performance of a wide range of specialist applications. Delivering a fast and constant flow of gas, our Argon gas cylinders are used when energy is required at high pressure, making them best suited to enhancing the performance of food applications. However, our cylinders are also suitable for low temperature applications too. We create custom gas mixtures and cylinder sizes for almost any Food/Wine preservation application and commonly used gases are Argon (Ar) & Nitrogen (N2). We always go above and beyond to provide tailor made, gas-based solutions that have been designed to accommodate your individual requirements across a diverse range of specialist sectors. With this in mind, all of our products can be adapted to accommodate your business demands, including application-specific cylinder designs and special gas fills. This means that we will be able to bring your innovations to life – supporting you throughout the entire development process in order to find the best resources when it comes to special gas fills for both new and existing applications. Armed with extensive industry experience, we approach every customised project with a fresh pair of eyes and an open mind, which often requires us to think outside the box. This allows us to develop gas mixtures and gas additives in line with your vision. Our professional and knowledgeable in-house experts provide consistent support throughout the development process, from proof-of-principle in the early stages right through to the market launch. We are with you every step of the way. Our ethos is simple. As a business working with some of the industry’s leading manufacturers, we always put safety first. With this in mind, we only work with manufacturers that hold all required industry-respected certifications for quality and safety. This is an area of our business that we refuse to compromise on. In order to maintain the highest levels of quality, safety, and performance, we ensure that we pay close attention to the production methods adopted by the factories that we work with as well as he safety measures they implement. We regularly inspect all of the factories that we work with and ensure that we review their industry specific accreditations on a regular basis. And the results really do speak for themselves! All audits are carried out by independent experts, customers, and development partners, in order to approve product safety and quality, demonstrating the effectiveness of our quality assurance measures. Beyond this, we are not only involved in the development of international technical standards for safety-critical applications, but we also lead by example, championing the rapid implementation of new regulations and applying this to our own products.